Every October, as part of Breast Cancer Awareness Month, two things are guaranteed: lots of pink and a great deal of back-and-forth about breast cancer screening. The debate has passionate advocates on both sides of the fence, but the subject can easily seem confusing or counterintuitive to an observer. This article will not be taking a position on whether mammography screening is a good or bad thing, but it will serve as a useful primer for anyone trying to understand what all the fuss is about. Let’s start with some basic definitions. “Screening” is the widespread testing for a condition within a specific population that is otherwise asymptomatic (not showing symptoms) and without known risk factors. The key word here, by the way, is asymptomatic. If you feel a new lump in your breast, then none of this applies to you. Similarly, if you have diagnosed BRACA mutations, a family/personal history of breast cancer, etc., then your doctor will likely recommend a mammography setup that is targeted for your risk group. Screening, by definition, applies to people who would not be considered above average risk for developing breast cancer. Women ages 40 to 44 should have the choice to start annual breast cancer screening with mammograms (x-rays of the breast) if they wish to do so. 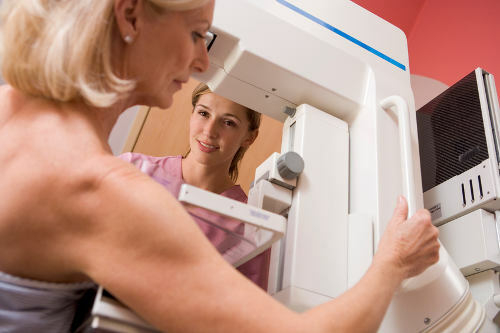 Women 55 and older should switch to mammograms every 2 years, or can continue yearly screening. All women should be familiar with the known benefits, limitations, and potential harms linked to breast cancer screening. They also should know how their breasts normally look and feel and report any breast changes to a health care provider right away. That last point about “benefits, limitations, and potential harms” is the whole reason you’re reading this article, by the way. The argument in favor of breast cancer screening is the most straightforward. By screening, you can catch cancers early and stop them before they grow and do all sorts of unpleasant things to the body. This is supported by the fact that the implementation of screening always results in a rise of diagnosis for the condition in question. It is incontrovertible that breast cancer screening has increased the number of breast cancer diagnoses that get made. So, why is there a debate? It’s because early detection, and more detection, doesn’t necessarily mean more survival. One of the trickier parts of the screening debate to wrap one’s head around is the idea that early detection and treatment of cancer does not necessarily lead to a reduction in cancer deaths. There are several reasons this can happen. The “lead time bias” is a type of confusion that can occur when the time of diagnoses changes, but the actual mortality rate does not. With screening, this can lead to scenarios where people are reporting that a method is improving survival rates even if no one is actually living any longer. Mortality rate is the number of people who die a certain way each year divided by the total population. Survival rate is the percentage of people who are still alive a set point of time after a condition is diagnosed. Mortality rates can only be changed by curing disease and preventing death. Survival rates can also be changed that way, but they can also improve if you simply diagnose people earlier. Imagine a type of cancer that is commonly diagnosed at age 50, with patients getting treated and dying at age 60 on average. This cancer has a 100% 9-year survival rate and a 0% 10-year survival rate. Now imagine a diagnostic test is used that can detect the cancer much earlier, and so we start detecting cancers during their occult (hidden) period. Now, we start screening and begin catching the cancer and treating as early as age 45. This creates a “lead time” of the 5-year difference between the pre and post-screening points. This lead time means that the survival rate for this cancer has now improved. Before screening, this cancer had a 0% 10-year survival rate. Now it has a 100% 14-year survival rate, which is even better. However, even though the survival rate has gone up, none of these patients is living to see age 61. In other words, screening has the potential to make it look like patients are surviving longer even if they are not actually living longer. Medicine is currently able to find breast cancers, but it is not good at telling the difference between growth speeds. The only real way is to adopt watchful waiting and see what happens. Obviously, the problem here is that if the cancer isn’t indolent, then you don’t want to wait around. Rates of indolence vary by cancer, with prostate cancer, in particular, being notorious for it. Indolence also messes with screening in a different way, which is known as a “length time bias.” Cancers have two general phases: a preclinical occult phase where they can be detected but aren’t doing anything overt (or at all) and a clinical phase where they start showing symptoms and become more obvious. Indolent or slow-growing cancers will naturally have a longer preclinical phase, while fast-growing ones will have a much shorter preclinical period. The preclinical period is when you really want to find fast-growing cancers, and this causes a conundrum when combined with regular screening intervals. Since the fast-growing cancers have the shorter preclinical periods, it is less likely that this period will extend into a period in which a screening is performed. The end result is that screenings have a good chance of catching slow-growing or indolent cancers, but a lower chance of catching the faster and more dangerous ones. The most aggressive cancers can actually form and blow past the preclinical period during the screening interval itself. Fortunately, this does not happen often with breast cancer. Breast cancer treatment has improved dramatically since the early 1980s, when screening started to become widespread. This means that cancers that would have required screening and early treatment to survive in previous years could now be detected normally and treated successfully. Whenever researchers try and evaluate changes in breast cancer mortality (or any kind of cancer, really), they have to keep this in mind or else they can find trends that either don’t exist or are not as powerful as initial appearances suggest. Every medical procedure and treatment carries with it a form of risk. Even the biopsy can have side effects and consequences. There are also peace-of-mind considerations to make. Someone who is told that their mammogram has found a potential tumor will undoubtedly experience heightened stress, which would only worsen if the mass is found to be cancerous. Even if the ultimate outcome is a successful removal of the cancer, going through all of that risk and distress for something that would not have caused harm if left alone is, from a patient care perspective, unacceptable. The exact rate of overdiagnosis for breast cancer is not known. Depending on the study you consult, it could be as high as one in three. This would, according to the anti-screening position, mean up to 33% of patients who got their breast cancer diagnosis from screening are undergoing unnecessary treatments, paying medical costs they shouldn’t have to, and in the worst cases being subject to complications and side effects (possibly fatal ones) for no benefit. A good outcome for screening is when a life-threatening form of cancer is detected that will respond to the resulting earlier treatment and intervention. A bad outcome for screening is when a stable or indolent cancer is detected, resulting in overdiagnosis and unnecessary and potentially dangerous treatment for no clinical benefit. Screening is only useful if it is performed in a way that, over the population, saves more lives from the good outcomes than harms them from the bad outcomes. Both pro- and anti-screening advocates can usually agree on all three of these. The debate focuses on partially subjective matters like how to balance the risk versus reward equation or more objective factors like how accurate or distorted certain statistics are (such as the one-in-three overdiagnosis figure mentioned earlier). Part of the solution may lie in developing an improved understanding of breast cancer biology. Mammograms can only identify the structure of a tumor, but the factors that dictate matters like indolence or speed of growth rest in things like genetic components and cell types. Until research has improved understanding in these areas, the debate over screening will likely continue. The best course of action for a woman wondering whether to get screened is to educate herself. Talk to your doctor about the risks, benefits, and limitations of screening and make your decision from there.